4. Big Snow Edd's memorial scramble. 5. Edd's memorial summit register written by Richard Branson. 6. 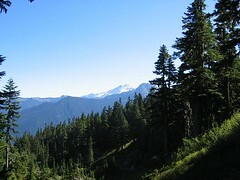 Thunder Mountain and Nimbus Peak. Warning! this is a long TR because it was a long 16 hr day! All climb pictures taken by Mesahchie Mark. I dropped my camera in the river...DOH! Thanks Mark! This is the first time I have been to the GPW are. WOW what did I wait so long for? The plan was to climb Sloan Peak This peak is easily done in a day 11 miles rt and 6000' gain via the corkscrew route no problem...right? 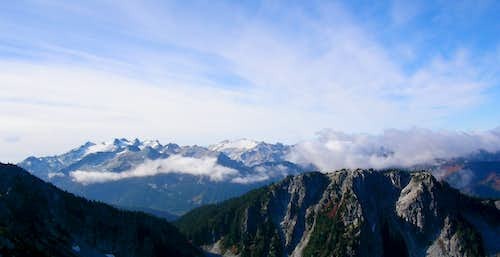 This mountain has all of the elements to make a great but tough climb. Brushy climbers path with river fords, dead fall areas across the path, bees, route finding, class II glacier travel, class 3&4 rock scramble. Well let me tell you This mountain kicked my a.... I am really tired and pretty beat up right now. The weather held out for us. It turned out to be a great day! Mesahchie Mark, jeff and I met at the trail. We go t a late start to begin with so that was a factor in our time issues of the climb. The elevation starts at 1900'. Head down the climbers path that lead you into a river valley. At a little over ½ mile is the first crossing of the river. The route is flagged but in the dark It is a different story getting through it. More about that later. You can find a sand bank to the right of the trail and get across with out getting a foot in the water. The second crossing one you can find a tree with an exposed root ball. With some class low class 5 moves across the root you have crossed. Then the last crossing is a wade in clf deep water. After we cross we sat and dried out feet off. Just after it took a picture of mark crossing I bumped the camera into the water. NO pics for this trip. BUMMER thought it was a goner we tried it later in the day and it still didn’t work. But today it fired up YAHOO! Around a 1000' there is a spot in the path that is taped off with a sign saying Bees next ahead.. Now I read on CC.com about this stump at the first major log crossing after the fords. But wasn’t sure of where it was. Who ever flagged it and put the sign there we will be forever grateful . We bushwhacked up around the dead fall area. From here the trail heads up on small switchbacks with 100s of trees and dead fall you climb over, under and through to 4800' where it comes out into the meadows and great views. We took a break here. This is where I found that my headlamps where not in my pack but on the seat of my truck. I had set them out to add to my pack cause I knew it would be a long day. That was when we found out we only had two lights for three of us. oh well we will make it work. From here the path heads up a ridge running to the east. 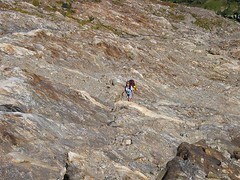 It ends up coming out in a saddle to the right of a. rock spur. We decided to take a more direct approach and headed off the path for some class 2/3 scrambling of slab. From the saddle we turned SW and head up the ridge. This is when you can view the glacier ahead. Sloan glacier is very active right now. It was grunting & groaning the whole time we where there. Heard and saw a lot of ice fall. 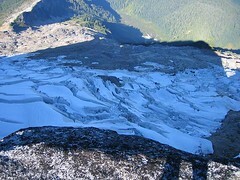 Large open crevasses through out the glacier. Then I noticed two climbers on the ice. Looked like they where dropping in and out of large crevasses. The guys got ahead of me and had stopped up at an entrance to the glacier. They where roping up when I arrived. 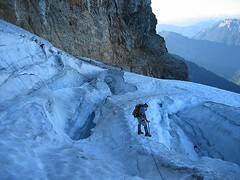 As we where roping up the other two climbers where scrambling up the rock right next to the glacier and the a huge chunk of ice falls off right next to them CRASH! I would say maybe 25' away. Then they came up and joined us. They said they where trying to get through down lower but was hairy. After a quick chat about the ice fall near them and name exchange they headed up first. There where fresh tracks headed up. We could not see from there what was beyond. I was concerned about a large crevasse up there that I saw from below. We headed up fallowing Chris & Erin tracks. Then I saw them headed back in our direction then I saw why. A huge bergschrund blocked the way. Large shaky flakes just ready to collapse. The tracks dropped right down in it though. There was no way any of the 5 of us where going to drop down in that . SHOOT I knew we should have gone to the upper shelf ( ). We all turn back. We lost over an hour on this little detour. But it was still fun Once down is when we had to remove equipment to gain the rock step above. The path we picked was a lot more direct than any other choice. Strait up 50' of rock band. One small section had a class 4 exposed area. The last move over the lip was a class 5 move with no holds. Then we topped out on a shelf just below the cliff . This is the spot we had to decide weather we should continue or not. It was getting late and we knew the decent was already going to be done in some dark. Chris and Erin had already headed up the glacier and where not having any problems. So we decided lets do it we where to close to turn back now and if worse came to worse we where all prepared for and emergency bivouac if it came to that. We headed up. 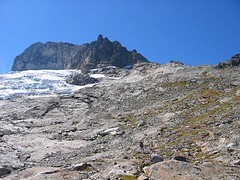 The first section is chopped up with crevasses. 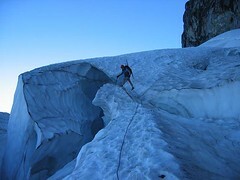 We had to maneuver around and through then we came upon a HUGE crevasse and skirted around it with no problem. Then came the skinny bridge but still a good comfortable thickness. Once across that you keep traversing up a small steep section and then it is down hill with no open canvasses and quick travel to the saddle. We unloaded all of our gear with a sigh of relief. Leaving our gear there we headed around the south side of the peak. 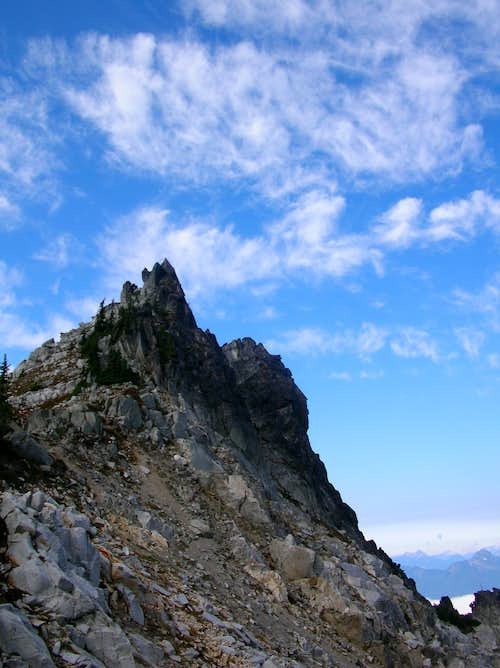 From the saddle there is a well defined climbers trail that traverse a shelf around to the west side of the peak. This is where my body decided it was going to shut down. What!!! I still had 800 feet to gain! I think between deflating and relaxing after glacier crossing and not eating enough I hit a wall. It was a tough climb for me from here on. As you gain the ridge on the west side you turn right and start to traverse the west side of the peak. 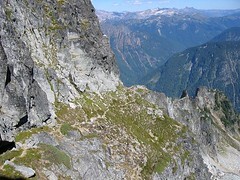 This leads to a section of class 3/4 scrambling up to the summit ridge. 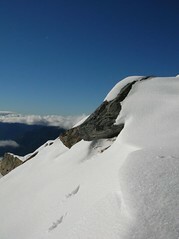 Once on the summit ridge it is a quick 3/4 exposed scramble across a knife edge to the summit. The view are just amazing. 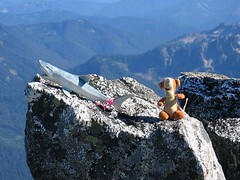 After taking pics of everything including tigger and sharky who insisted we take a summit pic of them together. We hung out at the top for a awhile and chatted it up with Chris and Erin. They where such a nice young couple. Oh to be that age and that fast again. Then they headed off ½ hr or more ahead of us. It was hard to leave the summit will all that was laid before us but it was getting to be around 5. We knew we would have to get down into the trees and on the trail before dark. We figured it would take us maybe 5 hrs or so. NOT! 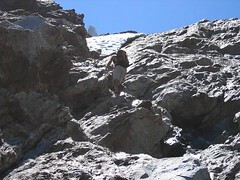 We headed down and crossed the glacier. By this time the lighting and the views where just getting better and better. We watched the sun go down as we descended the ridge down into the trees. At least we got off the rock before dark. We still had 4.5 miles to go in the dark. We knew what spots where going to give us trouble though...downfalls, bushwhack around the bees, and the river crossing maze. Hichen and I did not have lamps but Mark had his lamp and a small flashlight. Hichen is the one who went without a light. I had the little flash light and mark had his head lamp. We all stumble back down the trail in the dark. We only lost the trail a few times and had to spend some time finding our way across all the blow down and dead fall areas. The bee section came up and I told the guys I was going to go through instead of the bushwhack. I figured the bees would be resting and it was better to get a couple of stings than get lost up in the trees in the dark. I climbed over the hat someone put over the nest. Onto a log with a 8' drop into blackness. I jumped. and Landed. Using Marks light from his headlamp Hichen fallowed. Once he was on the tree Mark said BEES and turned and ran back. This left Hichen without light on top of this log. Hichen did not have a pleasant landing off the log but was fine and made it across. We stood down on the trail as Mark bushwhacked his way up and over to us. No one got stung. Now the only obstacle in the way was the river crossings. We arrived at the crossing and I just went through with my boots on. The boys went barefoot. Well so far so good. We got to the second crossing with the class five tree root climb. Crossed it no problem. Two down. Then we headed out and thought we where on the right path but when we arrived at the next crossing nothing looked familiar. So we took another path to see if we could find the crossing. I came around a corner and looked down and said What the F... We had done a loop back to the class five tree root crossing . By this time we where all tired and just wanted out if here and knew if we could cross this one spot we would be home free. So we went back out and just took all the turns opposite the ones we took before on our loopy loop. We found and crossed the last one. WE MADE IT!!!! . Its funny how much darkness slows down a descent . We arrived at the TH after midnight after a 7 hr descent with 4 of it in the dark. I kissed my truck. This was one of the most exciting, difficult, thrilling, amazingly fun climbs I have done. Even though our timing was off and we had a few little detour on the trip it was the most fun climb ever. Mark and Hichen are strong climbers and fun great guys. Thanks guys for a great experience in the mountains again. Hopefully they can tell you how it was for them. 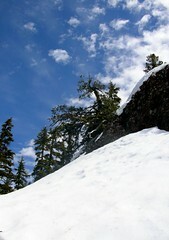 Clark "the one and only gully"
It has been a long time since I have climbed in fresh snow. It has also been a long time that a peak has brought me to tears. Clark mountain 8602' did it. 1. 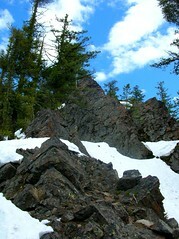 Boulder Creek route with a nasty class 2, "one and only gully" to get over the ridge in the snow. 2. 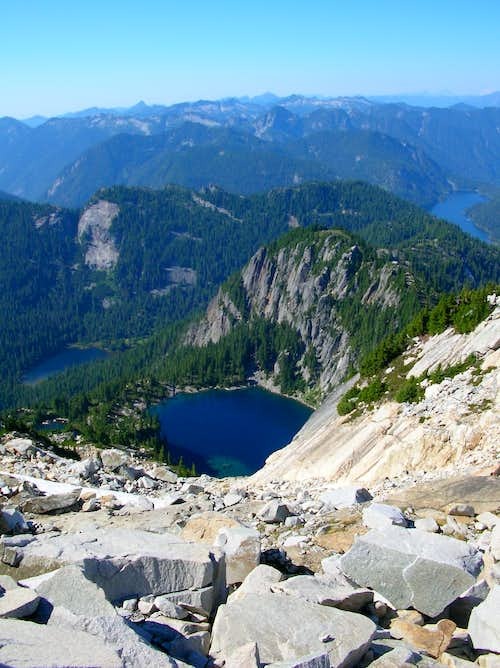 The Y route that runs up a water shed and has 2000' of class 3-4 slab to climb. This time of year it would be icy. 3. 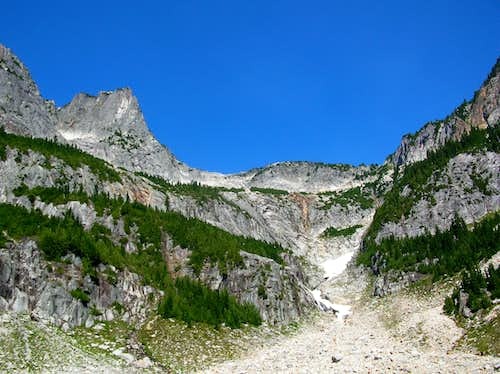 The Thunder Creek route. There are many accounts that this route is not easy to find or fallow. We found a TR by Mike Collins and Stephan saying it was difficult. Now if these two say it was tough then it has to be tough! We chose the boulder creek route. Dicey, Mesachie Mark and I headed up the trail early sat morning. The forest was full of color. All the under brush has turned great colors. The first 4 miles of the trail is level, then you take a right turn and head up boulder creek trail. After many switchbacks and a total of 8.5 miles or so there is a faint but easy to find climbers path. It is called the ‘Sheepherder’s Trail’. 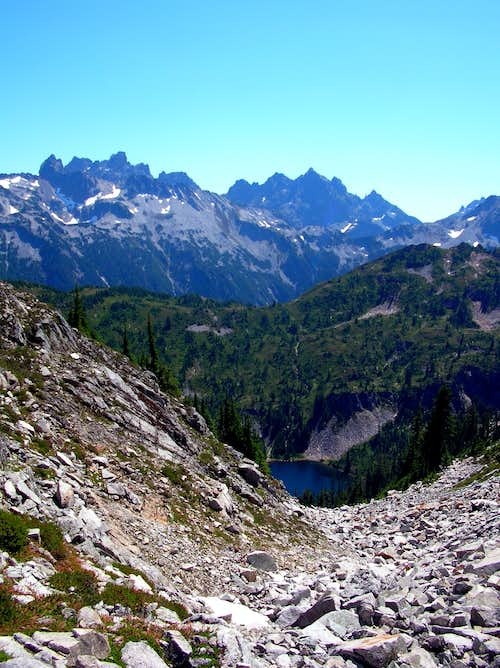 This trail takes you through the basin and then up to the SE ridge. 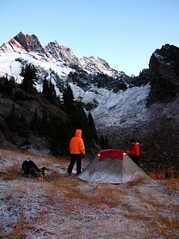 We stepped off the trail around 5700' and headed N-NW and found a great spot to camp at 6000' for the night. 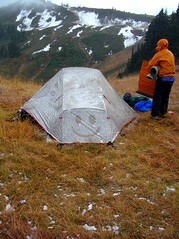 We set up camp in a snow squall and that is when mark told us it was his birthday. We celebrated a bit and hit the sack when the third snow squall of the evening hit. We woke up to clear skies with temp. at 22 degrees. A light dusting of snow covered everything down to 5500'. After breakfast and coffee we headed up. It was time to find "the gully". The snow was only a few inches deep up to 6500' then just kept getting deeper. The fog created by the sun and mountain started to drift, sink, and rise. After a long rising traverse and looking for the right notch striking out twice. 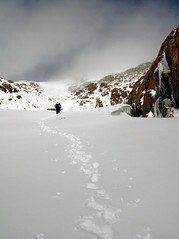 We continued traversing and reached the notch with "one and only gully" over the ridge. Holly cow they call that class 2 . We sat and took a break at the notch and took in the awesome views. It was 11:00 so, Dicey tried to call Team Cobra 2 but there was no answer. Time to head down the gully. I was a little freaked out going down this. The gully in west facing and had not seen the sun yet. The snow was light and fluffy like a powder on top of slab rock and frozen talus. It would not hold a foot well at all. I would call this a class 3 with snow on it. When I reached the other two down at the bottom they told me to turn around and look at what we went down. All I could say is “Holy sh-- Are we stupid?” They thought it was a funny but I was serious . "The one and only gully"
Dicey tried Cobra 2 again no answer. From the bottom of the gully we traversed our way over to a shelf. The traverse was slick and steep. Once we reached the shelf I was relieved. The snow at this point was close to 8"-10" and filling in all the nooks and crannies around the rocks. Drifts where getting deeper. Mark lead the way and kicked steps the rest of the way. Thanks mark! The snow was quite deep in sections where it drifted. Some spots we would post hole up to our knees. The last bit of the climb is on a class 2 section up to the summit. 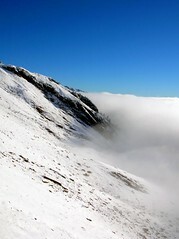 The summit was shrouded with fog and clouds. This is where the climber Tazz on one shoulder saying “do it, it will be fun” and the cautious Tazz on the other shoulder saying “is the risk worth it?” (They are always fighting) The climber tazz won. Mark and Dicey where about 150'-200' above me when I hear them hoot and holler. That was when I knew there where there. This helped push me up the last 150' of the climb. Thanks guys! When I reached the top I was so relieved and excited that I didn’t slip and fall, tears just started to flow. (Only for a couple of seconds and they where happy tears ) We all sat in the fog and cold hoping the fog would lift but it never did. The descent was much easier than what I had in my mind, I was relieved. We still had the gully to deal with. 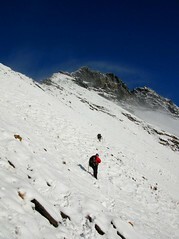 By this time the snow had been warmed up enough that the gully was quite easy to climb. Once back up in the notch we saw and where able to contact Cobra 2. They were off route. They couldn’t find the sheepherder path. They took a nasty steep route from the Boulder creek head waters up to the ridge just below the East peak. They where finished climbing and didn’t want to try for the summit at this point. Dicey talked to them and planned to meet them down lower. Now the last steep section and we where home free. We met up with her friends and showed them the easy way down to there camp. I am sooooo sore today it hurts to go up or down the stairs. My feet feel like they went through a grinder. All in all this was an adrenaline filled fun climb with two of the greatest people to share it with. Please pipe in guys with your words and pics. 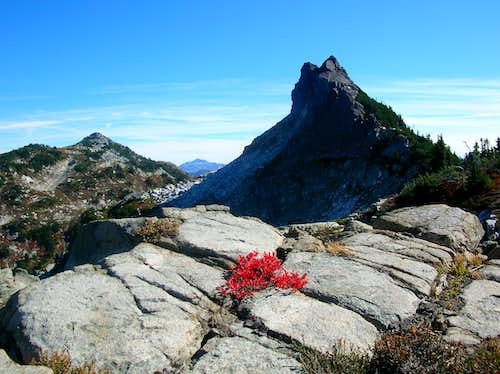 JimK wrote a great trip report on Earl peak which was my destination also. I will spare all the details of route conditions cause he did such a good job of it. I didn’t get to Teanaway till 3:30 am Sat morning cause I got a late start from PDX. The plan was to get on the trail by 5am so I could have plenty of time to summit and get back down to meet Action Betty at 29 pines camp. I never woke up till 7am...OOPS! This just put a damper on things from the start. 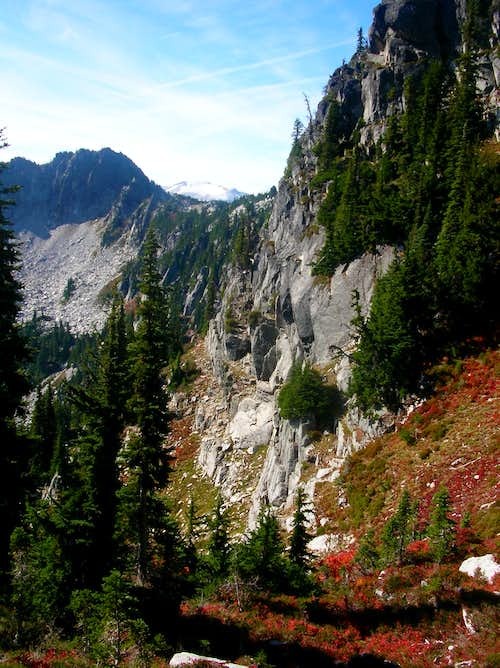 I figured I would try the SW ridge that leads to the summit from the intersection of the Bean creek trail and Beverly creek trail. The ridge looked good and even had a good section melted off on the south face. 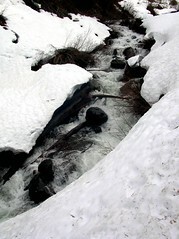 As I headed up the ridge I noticed an old ski trail headed up the creek. I had read JimK’s tr from last year and how the crossing of Bean was difficult. I also read another report from the weekend before saying the same. That is why I wanted to just head up the ridge to start. I was curious though, and headed back down the ridge to see if we could cross. I found the spot for the crossing but I knew I would get my feet wet and Tazz would have a hard time of it too. Not worth it. I headed strait up the side of the ridge. I should have stayed on the ridge the first time I was on it. Climbing up the side of it was very steep and a pain in the a.... I finally gained the ridge and headed up. Staying on snow till running into rock. This is where I stopped and took a break. I removed Tazz’s pack cause he had a really hard time climbing the steep parts up the side of the ridge and scrabbling around on the rock was hard for him too. At this point I was tired and not too sure I would make it by my turn around time. We scrabbled up the ridge. Half on snow and the other half on rock. FUN! I reached a point and just bonked, I needed food. We stopped and pulled lunch out. The views where really nice from here. I looked up and figured if I made it to the high point 5693' I would be happy and then turn around. Deflated I sat ate and rested. Tazz jumped up and gave an alert that he heard something. Hmmm must be a people coming up the ridge. I waited quit sometime till I could here anything. Dogs sure do have great hearing! Then three people came around the rock. I thought “damn that guy looks really familiar. Wait I think it is JimK.” I had seen many pics of him from his site and trip reports. So I just asked if he was Jim. Sure enough it was him and Trail pair. How weird it is to run into someone way up on a ridge not many climb. We chatted for a bit and they headed on up. It was a pleasure to meet them. I headed up to try for the high point. It was nice to fallows someone else’s steps and not have to kick them all myself. I reached a spot and decide to turn around. I made it to around 5400' or so and gave up. BLAH!!!!! Took some pics soaked in the sun and headed backdown. I stayed on the ridge all the way It was a nice ridge and was melted on a good portion of the south side. I kicked myself for wasting energy farting around with the crossing of Bean creek and climbing up the side instead of sticking with my original plan. I think I would have made it much further ifhad stuck with the original plan to take the ridge from the intersection. 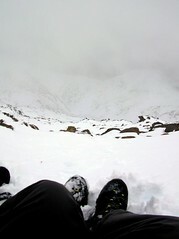 It was great to be in the snow and be in plunge step heaven on the way down. According to my map and calculations I did 7-7.5 miles and altimeter said acc gain was 3900'. steep climb up. Stopped not too far above this spot. 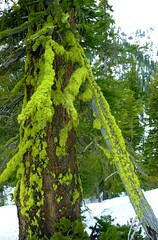 just love fresh melt water over new spring moss. Met up with AB and her two kids and had a good evening hanging around the camp. Her kids are both teens and wow it was a flash to the future with Josh! If one was not cranky the other one was. The next morning we got a late start out of the camp. 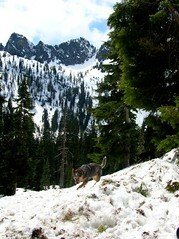 We arrived at the Snow Lake trail head at 10am. AB’s son came with us but her daughter was not happy and wanted to stay in the truck and sleep. She was cold (she is from Florida) all night and was tired. So we took off and headed up the trail. A well beaten path was in the snow. At about a mile in her son didn’t want to go further. So he asked if he could go back. We figured he could fallow the tracks back and if worse came to worse he could drop down to the valley floor and hit the parking lot. The only way out of the valley is to hit the parking lot first. He headed back and we continued on. I was really tired and kinda had the kids back there on my mind. We came upon a huge avy slope. We had already crossed several on the way up. This one was nasty and steep. It was around noon time and the snow was getting really soft. 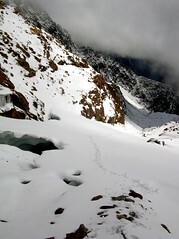 The route would require us to head strait up the avy chute. I was not too thrilled about it. We decided to stop here and take in the views and then head back to the kids. We didn’t go too far but still enjoyed the outing. We went our separate ways. I headed towards home and on the way figured I would take a quick drive down the famous Middle Fork. I wanted to see what all the hub bub was about. Well to me it was just another road. The forest was nice in a lot of spots and the river is just beautiful. I never made to the end. I turned around when I ran into a huge mud bog. Not too sure where it was on the road. I was a ways past an inter section and on a rougher part of the road. In the distance I could see mountains up the river valley. I assume they where the Lemah group but not sure. It was a nice ride but wasn’t too impressed and kind bored. Maybe if I went further It would have gotten better as far as views but it was just a nice forest drive like many around the NW. The river is spectacular though. I think I made it about 22-23 miles from the highway. What waterfall? Big Snow Edd's memorial scramble. One of his climb partners and friend Jeff Rogers came up with the idea to do a tribute scramble for him. We all decided Big Snow Mountain would be a good choice. 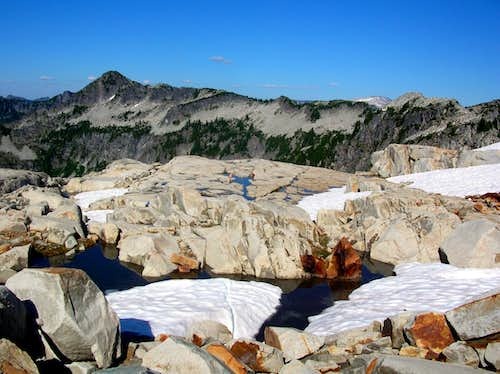 Mike had climbed Big Snow with Ed and knew Ed loved the area and it was one of his favorites. 14 folks(oh my!) joined in on the climb (plus Ed). Most of the folks in the group have tons of climb and scramble experience at all different levels. So that spread us all out. We all split off into smaller groups as to lessen the impact and took short breaks in areas impact would be minimal to none. We started out at 8:30 am from the TH. The day was perfect! Sun shining with temp at a comfortable level. We all regrouped at Hardscrabble lake for water and snacks. Then headed up to Upper Hardscrabble lake. We took the wrong path up to gain the gully. It took us up through some cliff and scrub. Just more of a pain than anything. After regrouping again at the base of the gully the climb begins. 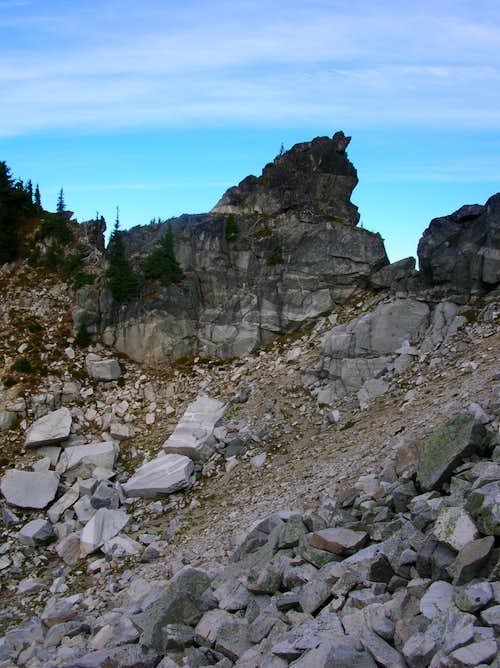 The talus gully is filled with huge boulders the size of cars to refrigerators. Fun stuff! 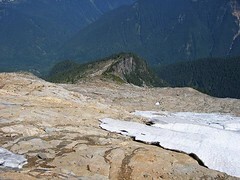 There was no snow in the gully except for a 20x20 patch. 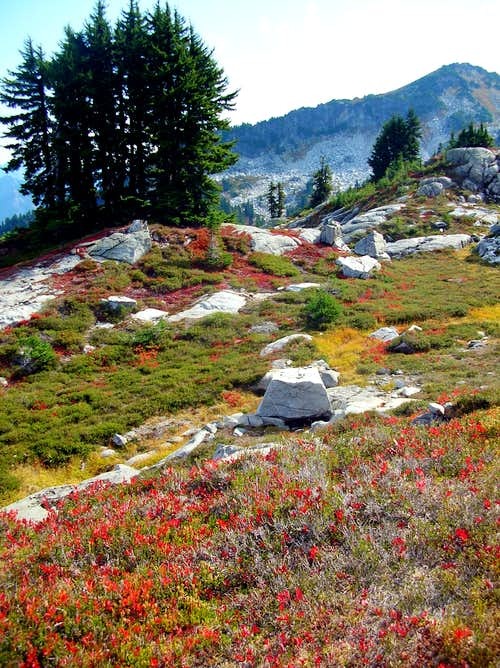 Once we dropped down out of the Col we hit the first snow patch. The you find your way to a flat granite slab Mike name the “football field”. HUGE! 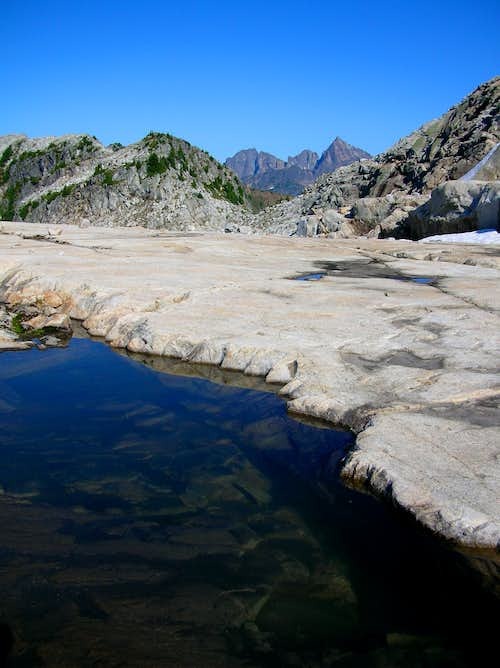 There is deep skinny tarns and streams running all through the slab. The fun begins. 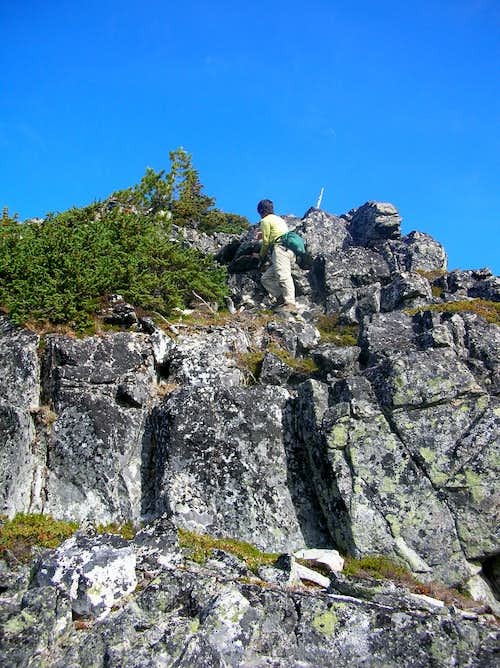 We scrambled along the ridge on great granite rock and slab. I love good rock! 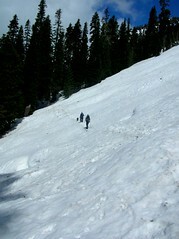 There were a few more patches of snow to cross but all fun stuff and not steep. 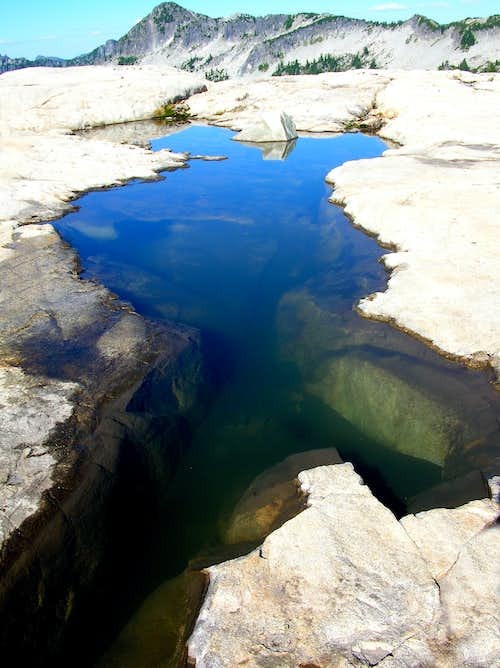 Jeff, Tom, Mike, and Randy dropped down to a beautiful, secluded tarn they named “Ed’s tarn” and took a dip before hitting the summit. It was Ed’s favorite tarn when there last. It was nice they got to spend time reflecting alone from the group. “EMTSRM” is an idea a poster from NWHikers came up with. Ed Miller’s Tribute Scramble Register memorial. The register holds a photo Ed took, a register for those who retrieve it to sign, a photo of Ed with words from his family, and some of his ashes. The idea is someone from NWHikers will climb and retrieve the register and then take it to the top of another peak sprinkle some of ed and place it for the next person. Then they post a trip report to let folks know where it is. Then the next guy/gal does the same thing. This way Ed will forever be climbing and be spread over the Cascades (as per his wishes). This idea works because last year a regular NWHTSR was moved all over the state. We all had enough space on the summit for heading off alone to think and say a few words to Ed if we wanted to. There where a few very close friends of his (including Tom who was with him when he fell)on this trip and I think it helped them go through this horrible grieving process. We all took a summit photo and sprinkle some ashes onto Big Snow Mountain. It was very touching. We all descended without to much difficulty. The last three came out by head lamp just after dark. 12 hrs rt with many long breaks. We all had an amazing day! This climb (while the road is still open see mountain page) can be done by a strong climber(or small group) in 8-10 hrs or less. Conditions are perfect right now and we used no gear. I did a lot of thinking and reflecting during this trip. I thought about what I do and why I do it, a lot. Ed’s passing has made its mark on me. He will never be forgotten. He was loved by many! This climb was for you Ed. 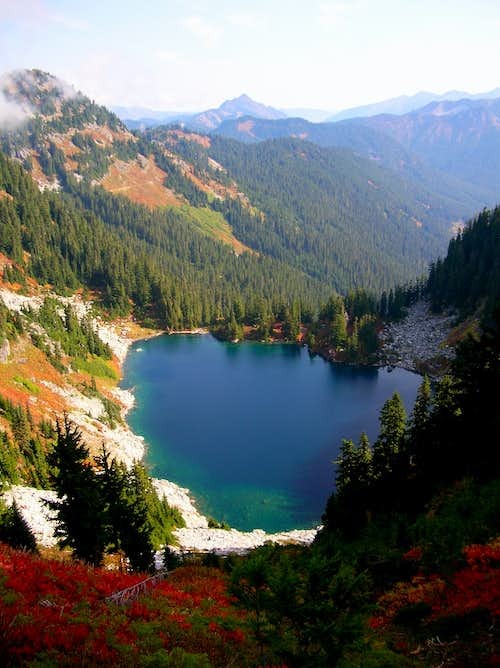 My you soar through the peaks you love so much forever! this is a video I put together of the trip it is raw but real. Life’s Great Mystery, no matter how well our intentions maybe we never really know what‘s going to happen until it does. It’s after the fact when we can reflect back and see what a Mystery Life really is. Saturday at Ed’s Memorial Services I had a chance to talk with Dayhike Mike and during our conversation he mentioned Ed’s ashes, this was the first time that I heard of this and immediately I thought how great it would be to take some of Ed with us on the Tribute scramble to Big Snow. This was my first time meeting and talking with DHM and to express what I was feeling was a bit awkward, but I felt strong enough to get the words out and DHM agreed. As the memorial was winding down and I found myself in Ricks Ed’s Brother) presences I could see in face and body language that he was having a hard time with something he was wanting to share with me. The words finally stammered out of his mouth… would you mind taking some of Ed’s ashes and releasing him on Big Snow? At this time I was reminded how magical Life’s experiences can be. Sometimes it feels like something behind the scenes is directing my life and putting people in front of me to remind me how connected we really are to each other, in Spirit and mind. My first response was sharing what DHM and I discussed earlier in the day. The tension was released and we all marveled in the fact that we were all thinking the same. 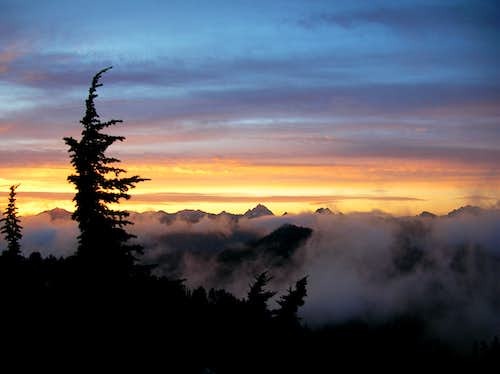 Rick said that Ed told him if ever the time came that he would want his ashes spread across the Cascades Mountains. I said to Rick something like, I never had the chance to meet your Brother and this is the first time meeting you and because of the character of your Brother and how he effect all of his relations in a good way I wanted to honor him by creating the Ed Miller’s Traveling Summit Register Memorial. Now this was going to be the perfect vehicular to get this request done. Who knew that this was to manifest in the way that it had in less than 5 days. Because of Jeff Rodgers desire to do a tribute scramble in honor of Ed Miller, the many people who knew and some that knew of him were able to get this done. I’m completely blown away by everyone’s dedication to make this happen. I’m honored in saying that the placing of the Ed Miller’s Traveling Summit Register Memorial (”EMTSRM”) was placed Sunday the 13th of August 2006 on the summit of Big Snow. Everyone in our party made it to the summit in honor of a great man and now it’s up to somebody/some bodies to get that register and take it to another peak and help celebrate Ed’s life. Some things to be mindful and respectful of: The “ENTSRM” contains a film container with some of Ed’s ashes and with the blessings of Ed’s family members they have directed me to make this available for the dispersal on each peak that the register is taken to. I would ask at this time that when and if you do come across the register that you be respectful and handle Ed’s ashes in a Sacred manor. Please release a pinch of Ed on each peak that you take the “EMTSRM’ to. By doing this you are honoring Ed's and his family’s request, along with celebrating one of Ed’s great passions by being in the mountains. I would also like to mention that all of the messages written to Ed on the day of his Memorial has been placed in the “EMTSRM” and is now available to those that come across it to come to know what a great man Ed was. 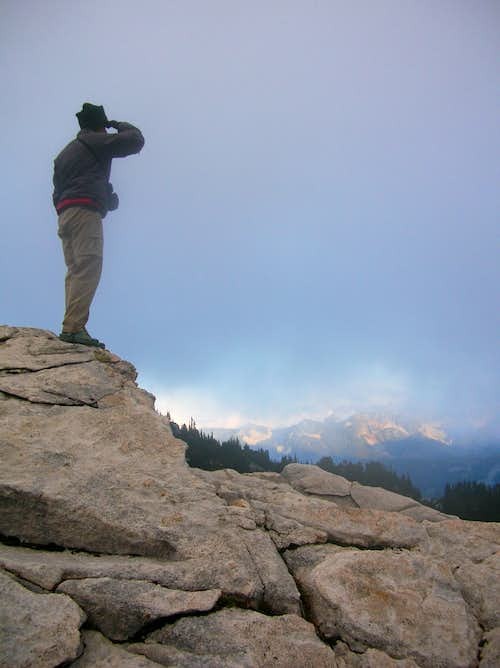 I invite anyone with the passion of mountaineering to join in this celebration by retrieving the register and placing it on another peak. If you decide to do so please post when you have removed the register and post again once you have placed it with its new location. I would encourage you to write a TR and share any pictures of you trip. Thank you in advance and have a safe and incredible journey. 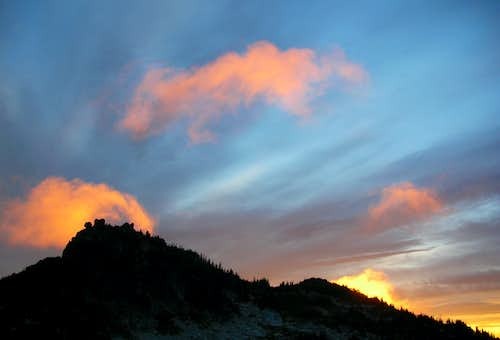 Thunder Mountain And Nimbus Peak. I had the pleasure of joining a few folks in the Thunder lakes area this weekend. Richard(for a day scramble), dicey, and Gabriel. For me this weekend was about, fighting and winning a battle inside myself, that I have been dealing with all season (a fear that came on me this year for some reason. I have never been this fearful of falling, failing, and the unknown like this in all the years and peaks I have climbed. This year has been tough.) Enjoying the area, taking in all the beauty Fall has to offer in the mountains, and the enjoying the company of some very wonderful friends. We all had different schedules so we had plans to meet on the trail or at the lakes. I reached Hope lake right as the sun was rising. The color was nice on the way up but wow once you reach the lake and the meadows around and above the lake the color was incredible. It didn’t stop there! It just got better and better and better! Richard caught up to me (shocker! I think this trip I was the slowest I have ever been.) 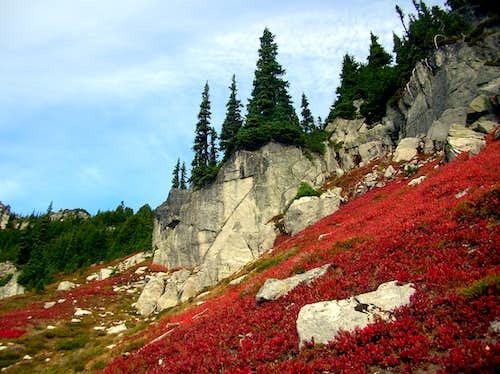 just above Hope lake. We hiked the very nice PCT trail. We stopped a couple of times for water and just hanging out. Dicey and Gabriel should be catching up to us real soon. We arrived at the jump off point at Trap pass. Still no dicey. 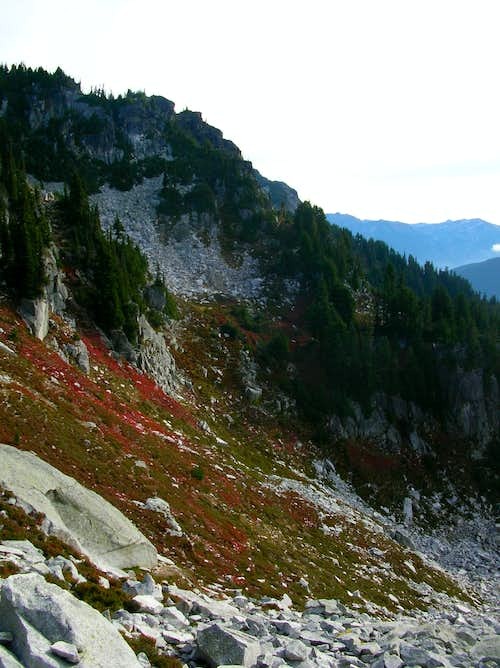 There is a path that takes you along the ridge up towards Slippery Slab tower. 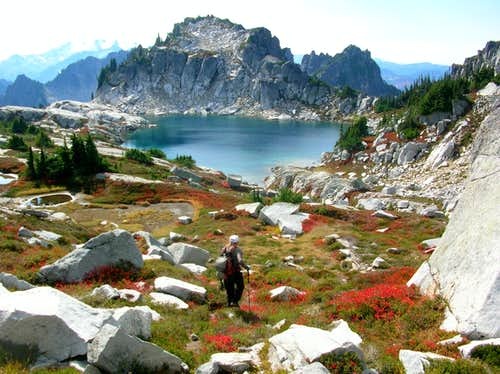 Once you arrive below SS the path disappears into slab, boulders, rock, and meadows. At this time I am wondering why dicey has not caught us yet. She is the most reliable person I have had the pleasure to climb with and this was odd. So of corse I am thinking something happened. It could be, an car accident, the car broke down, maybe Gabriel could not make it last minute, or they ran up K9 peak, or ,or ,or.....Too many things to wonder about. I was a little worried about them. 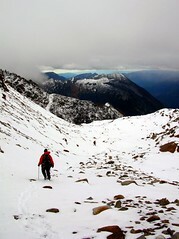 Richard and I continued along the traverse to reach Thunder pass. The traverse is pretty strait forward. A lot of boulder and rock hopping along with many ups and downs. Once below Nimbus peak you can pick either saddle to get into the Thunder lakes area. We chose the one on the right. This saddle lands you right to the base of Nimbus. We arrived and Richard wanted to tag Nimbus. After he waited for me to rest a bit we headed up Nimbus. What a great little summit! We both sat up on the summit. I looked for dicey. We hollered to dicey. Nothing. As we sat up top we looked for Thunder peak. You can see the peak but we were not sure which one it was. We knew it was not the high point looming over Upper Thunder Lake. 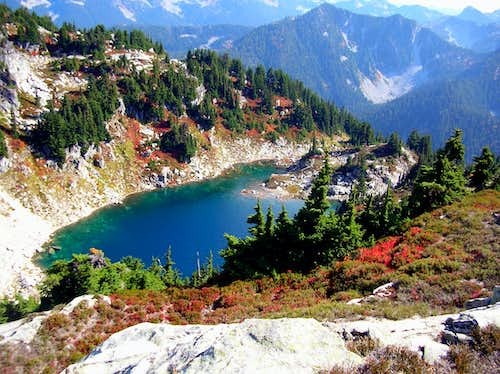 According to the map it is another ½-3/4 of a mile behind the highpoint above the lake. We dropped down off of Nimbus after signing the register. I left my camera so I have no pics from the summit. I found a good spot and started to unload. Richard wanted to get Thunder before he had to leave. I thought it would be best if I stayed as to not slow him down. Plus dicey, Gabriel, and I where planning on climbing Thunder too. I figured I would wait for them and maybe we could catch Richard. Richard took off for Thunder and I set up camp. What now? Well this is when I sat back and enjoyed all that our beautiful mountains have to offer. I poked around and took pics of the area. After another hour or so I really was thinking dicey and Gabriel are not coming. I watched for them at the passes. Worried a bit about why they have not shown yet. Then I started to wonder why Richard was taking so long. (Ok so I am a mom and that is what moms do they worry. It is our job.) It was too late to plan on hitting any peaks this day so I pulled out the whiskey. I had resigned to the fact they where not showing up and I was solo after Richard left. Although a bit boring I was fine with being solo. Richard was successful on Thunder and came back to camp. I made him a cup of tea and we sat and talked about the route to Thunder, why dicey was not there yet, and just plain good conversation. I very much enjoyed your company Richard! Thank-you for just being... you! All of a sudden “HEEELLLLOOOOWWWW!! !” It was dicey and Gabriel at the pass. What a relief! They climbed Slippery Slab! Dicey said she sent me a message about SS and gear but I never got it (I checked when I got home.) That’s ok because I would have slowed them down anyways. After much laughter about the mix up we settled down in camp. Richard headed home. The day had been sunny and really nice. I was planning on a great sunset for pics when in a matter of 10 minutes the Onshore flow fog socked us in a white out. Damn! (The forecast was for 20% chance of showers for Sunday so it was a little expected). The next mornings sunrise made up for no sunset! What a display of nature! I was so excited and running around like an idiot taking pictures. We dilly dallied around as the clouds started to lift and clear. Then we headed off to Thunder Mountain. Richard said he took the ridge all the way to the summit. 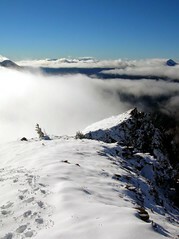 He did say he was forces to drop down in order to reach the summit ridge but it all sounded strait forward. 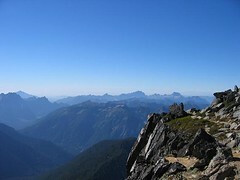 He also mentioned that it might be better to traverse the south side of the ridge. That is what we started out doing. Then we reached a bench with a view of part of the traverse. I have this slight fear eating at me(“go away just go away fear!”). I don’t like traversing steep heather but will do it if it is the only way. At this point Gabriel asked which way we wanted to go. I had it stuck in my mind that Richard made the ridge work, and we don’t know what is around the corner of the traverse. I was like lets do the ridge. For some reason I felt more comfortable knowing Richard made it work. Stupid move Tazz!! We climbed up a steep heather slope to gain the ridge. Once at the top I panicked a bit. I could not see a way down. Gabriel went down one way and dicey was looking around for another. I was having an all too familiar battle inside. I HATE this battle. I was thinking, “I don’t want to get in a pickle. I don’t want to fall. I don’t want to slow them down and make their trip crappy. They are better than me at this. I do not want them to have to babysit me either (I hate that)” God I hate this battle! I almost turned around again. This is not the first time I have had this battle this season. I have turned back on several peaks due to this fear. Gabriel was making his way down and dicey followed. You could tell others have done the same route. I yelled at myself “FOCUS!! !” and “you can do this, you have done harder and more sketched stuff!” Dicey was telling me it was good to go. I knew she would not tell me that if it wasn’t. OK I will go. “Just focus and keep moving” I dropped down. 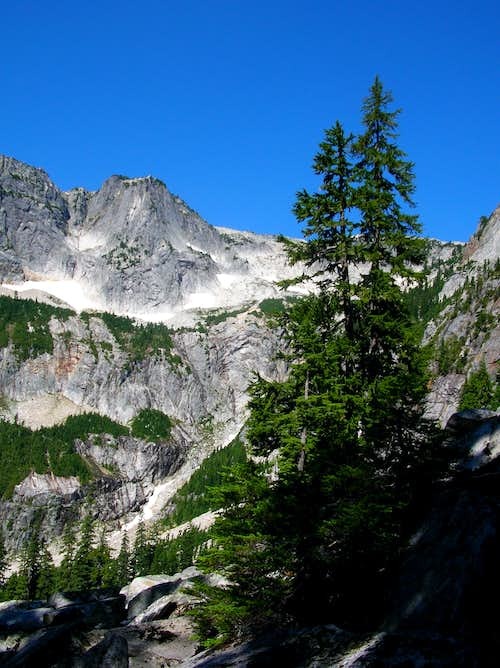 You go through a bit of bushwhacking and lots of veggie belays over rock steps to reach a large boulder field. We went through all of that when we could have done the traverse with less gain and loss. What a waist of time. Sorry guys I will shut up from now on and tell my fears to DIE! 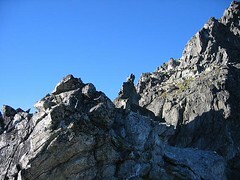 From this spot you can see the summit and what would be the best route. Losing more elevation we reached a steep heather gully that takes you to a little saddle. 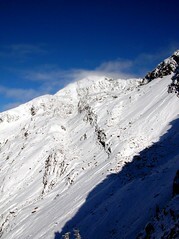 Then from there you head up the class 3 summit ridge. I was Having the battle again but this time it was easier to stomp it down and just climb. The summit is small but has nice views. I was proud I had made it and at the same time shaking like a leaf. Inside I was saying “There see, take that! It was not that bad was it? Silly fool!” I used what dicey told me last year. “Don’t look at the big picture. Focus on what is right in front of you.” I focused really hard on that, and it worked! Thanks lady! We sat and enjoyed the summit for quite some time. Then we headed back. We did the traverse all the way back using benches and steep slopes. It took us no time to get back. What a great climb! Gabriel and dicey thank you for your patience with me. I was planning on hitting Thor with them. They had one more night and other peaks to hit too. They headed up to do Nimbus including the fin as I packed up. After eating lunch and packing I watched them on Nimbus as I made my way to the saddle. It had turned out to be such a great day! I realized that If I joined them for Thor I would be doing a pressed, headlamp descent back to the trail head. I really didn’t want to do that. I backed out of Thor and parted ways with dicey and Gabriel. They had big plans for several other peaks. I milked every second I had up there. I didn’t want to leave. I wandered around taking pictures and enjoyed the area before dropping back down to the trail. Even the trail was nice as the sun got lower. WOW what colors we have this year. I always say this trip is one of my favorites but this one is. The great people I had the pleasure of being with. The battle I won inside myself. The beauty of the area. The Fall colors that just burns into you. What a great trip. I will be back for Thor and others. Thanks again for the pleasure of you company Richard, dicey, and Gabriel.